Fruiting bodies of Calonectria pyrochroa, photographed by Enrique Rubio Domínguez. Calonectria is a genus of fungi growing saprobically or parasitically on plants, characterised by their distinctive ascomatal wall structure. Characters (from Rossman et al. 1999): Ascomata superficial, solitary or gregarious, often on a small, basal pad of pseudoparenchymatous tissue, without a byssal subiculum or well-developed stroma. Ascomata globose to ovoid, orange to scarlet or dark umber, rarely yellow, KOH+ dark red, yellow in lactic acid, ascomatal base darkened, scaly to warted. Ascomatal wall of two regions: outer region of thick-walled, globose to angular cells extended to form scales or warts; inner region of hyaline, thin-walled, elongate cells. Asci clavate to long-clavate, apex usually simple, asci often evanescent at maturity. Ascospores ellipsoid to long-fusiform, 1- to multiseptate. Anamorph, where known, Cylindrocladium. 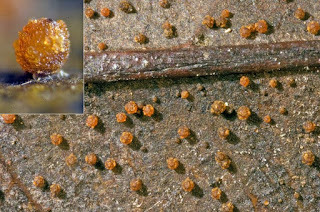 Saprobic and pathogenic on dicotyledonous and monocotyledonous plants, often fruiting on decaying leaves.